Smart Money Smart Kids is a MUST read for any parent who wants to ensure that their children learn from an early age that money is a responsibility to be taken seriously. It’s no secret that I am a HUGE fan of Dave Ramsey’s principles – they have changed our financial outlook forever. 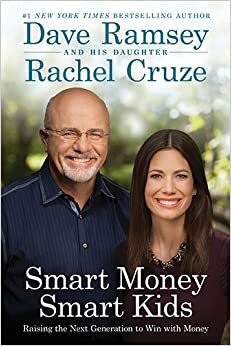 So, when I saw that he and his daughter, Rachel, were writing a book about how to instill financial wisdom within children, I was immediately excited. Even though we have a few years before we’ll be teaching our not-yet-born daughter about money, it’s really important to start learning these lessons now so that we can implement them later with ease. Dave and Rachel have broken down important concepts – such as budgeting, college, working hard, etc. – into “easy to reference later” chapters so that it’s not only something to learn from now, but a book you can reference again and again as you parent your children into adulthood. In this culture of credit, debt, and impulsive spending, it is SO vital that we teach our children to save, give, and to WORK. Otherwise, they will fall into the same traps that we did – student loan debt, car payments, credit cards. I long for our children to experience the freedom that we are working so hard now as adults to achieve! We are ready to break the chains of debt in our family tree and to teach our children to “live like no one else” – which will change the legacy of our family forever. This book has prepared us well for what lies ahead and has been a great reminder that we must also LIVE OUT these concepts if we want our children to embrace them. I will blog about specific concepts later – but I couldn’t resist the opportunity to share this book with you! To pre-order the book AND receive extra material, click here! It will be released on April 22, 2014. I just received the book I ordered from Daveramsey.com. I am sure it will be of benefit to my daughter who is home schooling her children but I must say two things. 1.) I had it in my brain that this book would be juseful as a “hands on” guide for young people; not their parents. 2.) Not that it matters to me but your advertisement said I would AUTOMATICALLY receive some “free stuff” if I ordered the book through Daveramsey.com but I received only a book. William – if you pre-ordered the book, it was stated on the website that there would be electronic freebies. I have no control over that 🙂 Check your email confirmation perhaps for download info?